Carl (Charles Sprague) Ruggles was born in East Marion, Massachusetts, on March 11th, 1876. Trained as a violinist, he also studied theory and composition in Boston with Josef Claus and John Knowles Paine. (Plans to study composition with DvoÅ™ák in Prague were put off when a financial sponsor died). In 1907, Ruggles moved to Winona, Minnesota. In this small city on the banks of the Mississippi he founded, and for a decade conducted, the Winona Symphony. He also gave lessons, composed, and began painting during this time. 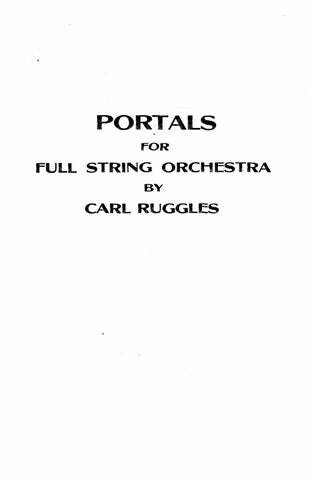 Ruggles moved to New York City in 1917 and, supported by teaching and private patronage, became associated with Ives, Varèse, Cowell, Slonimsky, and Seeger. Most of his major works were begun and first performed during the years in New York (1917-37). After a period (1938-43) during which he taught composition at the University of Miami in Florida, Ruggles settled in a converted schoolhouse in Vermont, where he had been spending his summer since the ’20s. His musical activities during this time consisted mostly of ruthless and painstaking revision of his earlier works. (He started few new works; the only one completed is the short hymn tune Exaltation, written in 1958 as a memorial to his wife). He turned mostly to his painting : which grew increasingly abstract : during the Vermont years of his life. Carl Ruggles died in Bennington, Vermont, on October 24th, 1971. 12:00 4 4 4 4 – 4 3 3 1; Timp. Perc. Pno. Str. 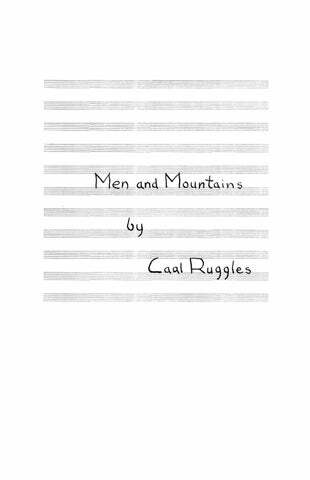 (2nd Movement: Men and Mountains) for String Orchestra 3:00 Str. 10:00 5 4 5 4 – 6 6 3 1; Timp. Perc. 2Hp. Str. 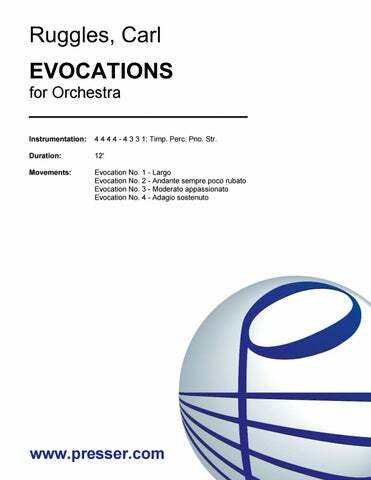 Version for Large Orchestra 12:00 3 3 3 3 – 4 3 3 1; Timp. Perc. Pno. Str. for Orchestra 10:00 3 3 5 3 – 4 3 3 1; Timp. Perc. Pno. Str. for String Orchestra 7:00 Str. 14:00 5 5 5 4 – 6 5 5 2; Timp. Perc. 2Hp. Str. Solo Voice and Orchestra 12:00 Mezzo-Sop. ; 1 0 2 0 – 1 2 0 0; Pno. 2Vln. Vla. 2Vcl. Cb. Blistering with intensity, the twelve-minute piece makes use of Ruggles’ personal brand of atonality through dissonant counterpoint. The work makes for intriguing listening, with slithery phrases coming together into satisfying climaxes. Wind lines wither like dying flowers and coil into stabbing chords. Throughout Ruggles paints a dense canvas of sound, with instrumental colors blurring together in unusual mixtures. The orchestra gave the work a performance of surging vitality to make a strong case for a composer whose music deserves to be heard more often.